I will break down the top Non-Profit WordPress themes into the top themes for churches, charity, environmental, political, and activism. There are so many free and premium WordPress themes on the market that it can be difficult to decide what to use and when. Many times the free themes are simply not enough for your online business website so a premium theme is necessary. Most themes are relatively inexpensive, under $100 USD so a premium theme for your WordPress site is definitely a good option. Below I will break down the nonprofit themes into groups for easier navigation. I will show you the top theme for non profit churches, charities, environmental groups, political sites, and activists. 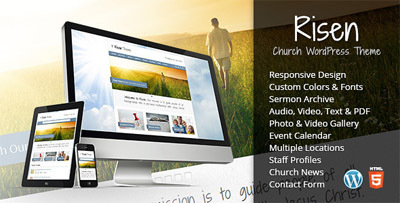 If you are a religious organization then you need the risen church wordpress theme. This theme inlcudes a image and video gallery, sermon archive, calendar of events, support for multiple locations, staff members, and news. Inside the sermon archive you can add audio and video, while sorting through them via date, category, speaker, or tag. This is a highly customizable theme with multiple backgrounds, colors, and fonts to chose from. Another great feature is that the theme is mobile optimized and ready for smartphones and tablets. With full support and a price tag of only $45 this is an excellent theme to purchase. The WordPress Aid theme is perfect for charity organizations. The main focus is to raise funds for the charity while alerting website visitors about important issues occurring throughout the world. Priced at $45 this is a very affordable and stylish theme for a wordpress site. It is very easy to use and set up and comes with customer support if you need assistance setting it up. There are many color options as well as well as a easily customizable logo area. With 70+ social networking icons ready to go the site is truly ready for a web 2.0 charitable organization. 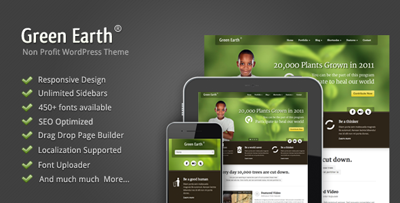 If you are looking for an environmentally friendly wordpress theme then you need to have a look at Green Earth. This theme was created to service both businesses and not for profit organizations. It is very simple to use and comes with a ton of features. The theme also includes over 450 founts with a way to upload your own custom font if you cannot find one you like. This site is set up for search engine optimization (SEO). There images support alt tags to help the search engines understand what the images are. The site layout is also customized to allow the search engine spiders to find content before the sliders. This shows more relevancy to the content and helps you rank for your specific keywords more easily. This theme costs $50 which is relatively inexpensive for most premium wordpress themes. 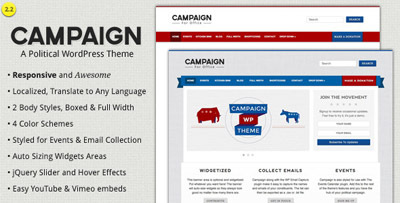 When running a political campaign or running for any electoral office you need to purchase the Campaign wordpress theme. These is a built in form to capture email addresses to include in a newsletter or any promotional marketing you do. For example, the night before the vote you can email all your subscribers a reminder to vote for you. This is a very convenient feature and is easy to set up and utilize. A calendar shows upcoming events that you are holding where people can find you. No mater what political party you are in, this is the ideal wordpres theme. Purchase this theme for only $40 USD today. 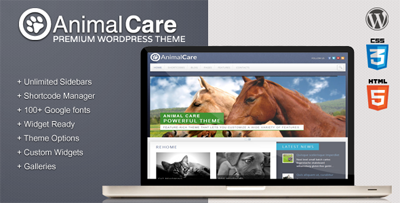 When seeking out the ideal activism wordpress theme the one that comes to mind first is the Animal Care theme. It is very responsive and full of customizable features. Priced at only $45 this is affordable for any website owner. You have an unlimited amount of sidebars, over 100 fonts, shortcodes, and much more in this activism theme. There you have it. 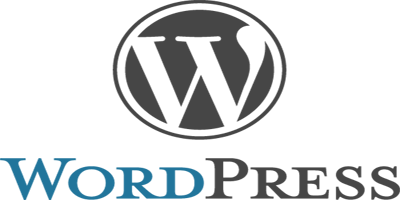 I have laid out the top non profit wordpress themes. If you think I left anything out or have any suggestions please leave them in the comments below. Happy website building!